We've created these fun 3x4 and 4x6 Element cards from our I Heart Summer line just for you. Simply click the link to download, save to your computer, print on your favorite cardstock and you're good to go. **Please note - it's a very large file to ensure good print quality; depending on the speed of your internet connection it may take a bit to download. Enjoy! Get your FREE downloadable digital elements! We had so much fun designing our Simple Stories collections...we just couldn't stop! We've created these fun downloadable elements that coordinates perfectly with your Simple Stories collections - simply download, print and trim or punch to add even more creativity to your Simple Stories elements, album and projects! These darling circle elements are perfect for adding that extra touch throughout your Simple Stories album, from your pre-designed element pieces to your photos and journaling! These circles are designed to fit the Fiskars 2" Circle and Fiskars 2" Scallop squeeze punches for easy punching and cropping. 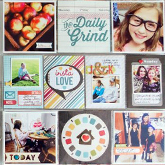 These fun and functional word strips include words and titles that you can use to highlight your photos throughout your album, decorate your elements or use in your journaling blocks. We've included a large variety of words that cover the entire year of seasons, holidays and just every day life. Simply print on cardstock and trim! What could be more fun than adding your own journaling. You'll love these handy little distressed blank labels that are perfect for labeling your photos with names, dates and events, or even adding journaling and notes to your pages, elements or layouts throughout your album.